The Star Series has 3 colours: 7101 White Star, 7901 Black Star and 7902 Grey Star. 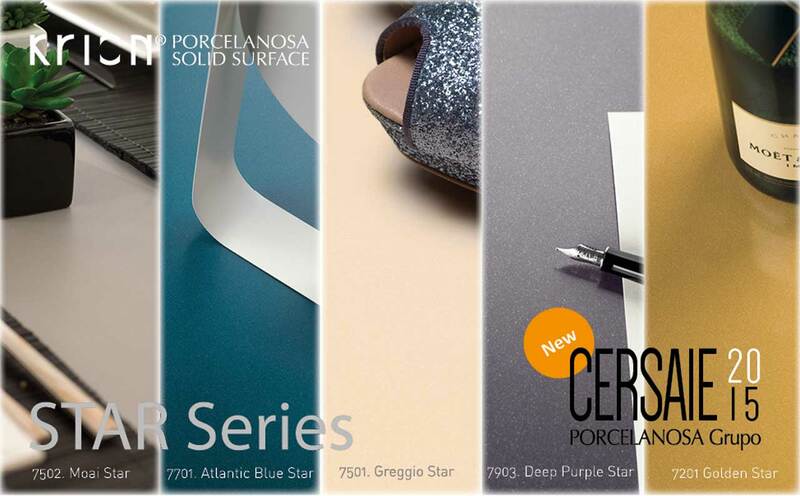 At CERSAIE 2015, at the PORCELANOSA GroupKRION® stand, we are presenting the new members of the Star family: 7501 Greggio Star, 7502 Moai Star, 7701 Atlantic Blue Star, 7201 Golden Star, and 7903 Deep Purple Star. The Star Series is growing, incorporating clear tones which maintain their characteristic metallic reflection. With the use of new particulates, colours which transmit more tranquillity and peace have been obtained, which combined with the reflections of light, create spectacularly beautiful visual nuances.